At some point in our lives most of us will face misdemeanor charges and unfortunately, some of us may even face felony charges. Misdemeanors, although considered small or insignificant crimes, are still crimes and can have direct and indirect consequences that will negatively impact you for the rest of your life. Felony convictions are even more devastating. Having a felony charge affects your right to vote, housing, employment, as well as your ability to pursue a successful career because convicted felons can not receive federal financial aid. Aside from this, being a convicted felon usually causes family, friends, and community distrust, which can lead to social and emotional isolation. An expunge record in Rhode Island will give ex-offenders a new start and help restore their civil rights and privileges. Expungement is a legal process used to clean-up criminal records. This allows an arrest or conviction to be erased permanently from an ex-offender’s criminal file. However, this procedure is only allowed for non-violent crimes. To qualify for expungement an individual must be deserving (one who exhibits good morals and good behavior) to have their criminal charges removed from public records and from law enforcements agencies. After five years (misdemeanors) or ten years (felonies) most ex-offenders can have criminal cases erased in Rhode Island. Under the new revision (2010) individuals on probation can get their criminal charges deleted, regardless of the nature of the crime, after their probation period has been completed. Expungment is simple, affordable, and does not require a lawyer. 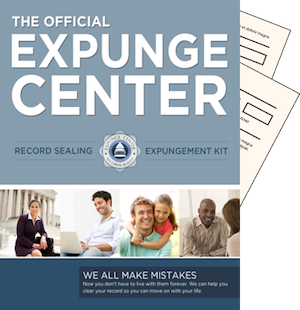 All you need is our do-it-yourself sealing and expungement filing kit and follow our step-by-step instructions. Our kit comes complete with all the forms needed for erasing criminal backgrounds in any state. We are confident that our kit, carefully designed to meet each states’ requirements, will work for you or we will refund you 100%. After purchasing our kit, you will need to follow these simple steps to have your criminal case cleared and sealed. 1. File a motion to dismiss the criminal charges with the original court that handled your case. The clerk of court’s office will help with the paper work and will set a hearing date after the motion has been filed. 2. Notify the police department that brought the charges and the Attorney General Department of your hearing date. 3. Attend the hearing and be on time. Rhode Island requires that an ex-offender exhibit good moral character, be rehabilitated, and not have any serious offenses after the time of the original crime before the application will be considered. 4. If you meet all the requirements for Rhode Island Expungement, a judgment will be signed removing your criminal background and copies of the judgement will be mailed to the Attorney General Department and to all law enforcement agencies that were involved with your criminal case or cases.